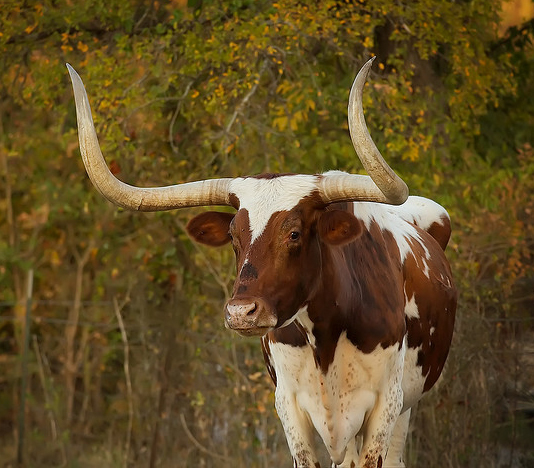 Texas Longhorn Steer; photo by Roy Niswanger on Flickr (use permitted with attribution). The mere sight of a longhorn brings to mind the old west. "Their long, polished horns sometimes ran six feet from tip to tip ... they were lean and lithe, alert as a deer, half-wild, half-savage, half-human" (from "The Saga of Rodeo" by cowboy writer Chuck Walters). In 1493, Columbus brought Spanish cattle to Santa Domingo. Within 200 years their descendants were grazing the ranges of Mexico. Translating wild cattle into hard cash was an epic struggle between man, beast and the elements - from this grew the romantic legends of the Western Cowboy. ...In the quarter century following the Civil War, 10 million head were trailed north...Longhorns have ideal characteristics - they can go incredible distances without water; rustle their own food; fend for themselves; swim rivers; and survive the desert sun and winter snow... (condensed from Longhorn History: Texas Longhorn Breeders Association). 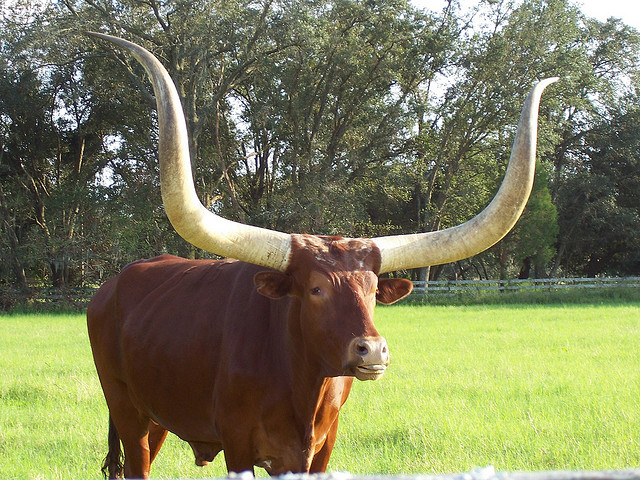 "Most bulls today have horn spans of 50 inches or more - 60 inches is now considered normal; many bulls are over 70 and even a couple over 80 inches." - Kirk of TexasLonghorns.com. Texas also recognized Texas Parks & Wildlife's Foundation herd of longhorns as the official longhorn herd of Texas in 1969 (Senate Concurrent Resolution No. 79, 61st Legislature). By the 1920's, the Texas longhorn was on its way to extinction. Due to efforts by Texas Forest Service personnel collecting small herds and placing them in Texas state parks, this unique breed was preserved.